Dummy knobs do not turn. They don't have locks, axles or latches. Dummy knobs are fake, fixed knobs used to open and close a door that doesn't have a traditional latch. Available in common designs including handlesets and levers, dummy knobs also are used to dress up inactive doors. They're inexpensive and simple to install with only a tape measure and drill/driver. Dummy knobs have no working parts. Dummy knobs often are on the exterior side of a shallow closet, pantry or shelving unit when there's inadequate room to go inside and close the door behind you. This type of door doesn't have a traditional latch, but sports a magnetic or ball-catch that holds the door shut. The dummy knob is installed on the exterior side of the door and used to pull the door open and push it shut. Handlesets are versions of inactive handles that serve the same purpose. French doors typically require dummy knobs on both sides. French, or double doors, hinge on the jamb side and join in the middle. The inactive door, even though it operates, doesn't have a traditional latch, doesn't need a working doorknob but still needs to open and close. The latches, pins or cylinders for double doors typically are located at the top and bottom and must be released before using the inactive door. 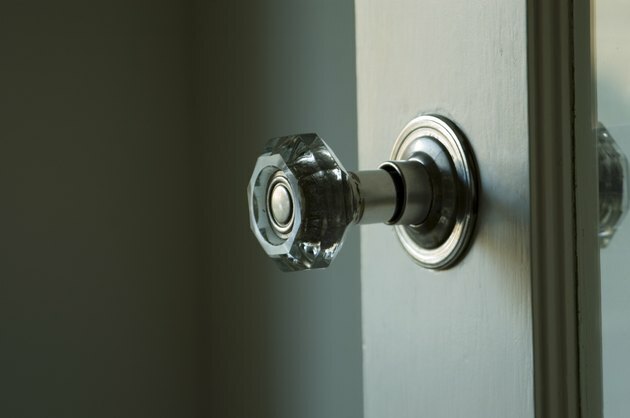 Most doorknobs install 36 inches vertically from the bottom of the door, but check existing knobs for height to ensure they match. The backset or horizontal measurement from the edge of the door typically is 2 3/8 inches for an interior door and 2 3/4 inches for an exterior door. The point where the vertical and horizontal lines intersect is the center of the dummy knob. The plate on the dummy knob typically has two holes. Center the dummy knob over the intersecting lines and use the screws provided with the dummy knob to secure the knob to the door. Handlesets center the same way, except that handlesets typically have two mounting points: one at the top and one at the bottom. In some instances, the 2 1/8-inch bore hole for the doorknob already has been drilled and the use a cover plate is required. The dummy plate consists of two plates -- one for each side. One plate has a shaft. Place the two covers over the hole, one on each side of the door. The shaft on one plate penetrates through the hole on the opposing plate. Thread a screw through the plate opposite the shaft and tighten to secure the plates together to cover the hole. The dummy knob screws onto the plate. Drilling pilot holes through the cover plate usually is necessary for the installation of a dummy knob.